I have been dying to make stuffed peppers for months. As I was daydreaming about the evening meal for Monday, I was trying to keep in mind what I had in the kitchen, ready to use. Sausage…mushrooms…onion…tomato sauce. I could certainly make a meal out of that, but it would probably be a recipe I’ve turned to before with those ingredients and I was dying for something new. I visualized the inside of the kitchen cabinets in my head and saw the dried pasta sitting there, tempting me. Though it would have been convenient for me to whip up another pasta dish, I was still trying to think outside of the recipes I have recently tried. The light bulb went off as I saw (still using the power of imagination) a bag of Basmati Rice I bought months ago, in the back of the cabinet. It all came together as I conducted a recipe search for stuffed peppers; I had everything I needed to create a delicious filling. Don’t get me wrong, I get a ridiculous level on enjoyment from grocery shopping and think of it more as something fun to do and less of a chore. However, I feel a sense of accomplishment when I happen to have all the ingredients required for a great meal. At this point, I should probably admit that I have yet to get in the flow of planning for the week. Menu planning is one of my resolutions for 2010, and by this time, next year, I will have the cabinets and fridge stocked and the weekly menu prepared. In the end, I still had to pay a visit to the market to pick up the red peppers required for this dish which is further evidence of my failure to plan. Once the sausage is cooked, remove it from the skillet. 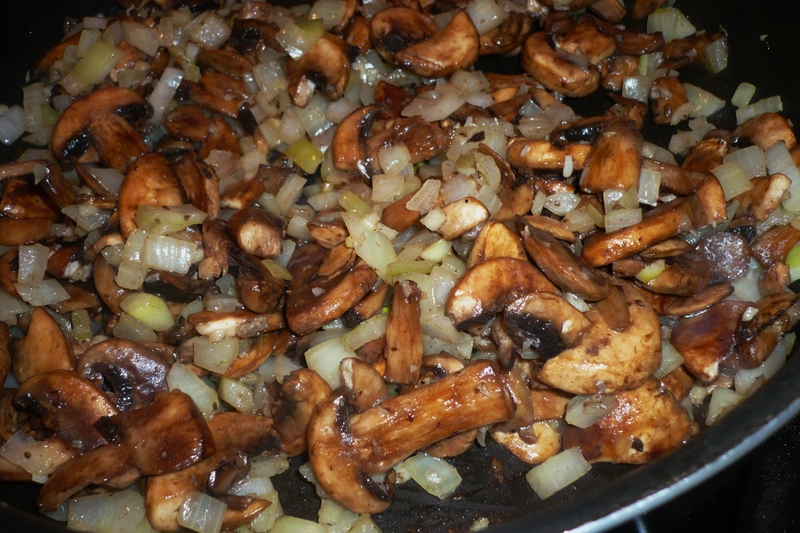 Add the garlic and onions into the skillet and sauté 3-4 minutes. Add in the 3 cups of cooked rice, and sauté with the onion/garlic for a couple of minutes. Add the sausage back into the skillet and mix. Add 1/2 cup of tomato sauce and 1/2 cup of the cheese. 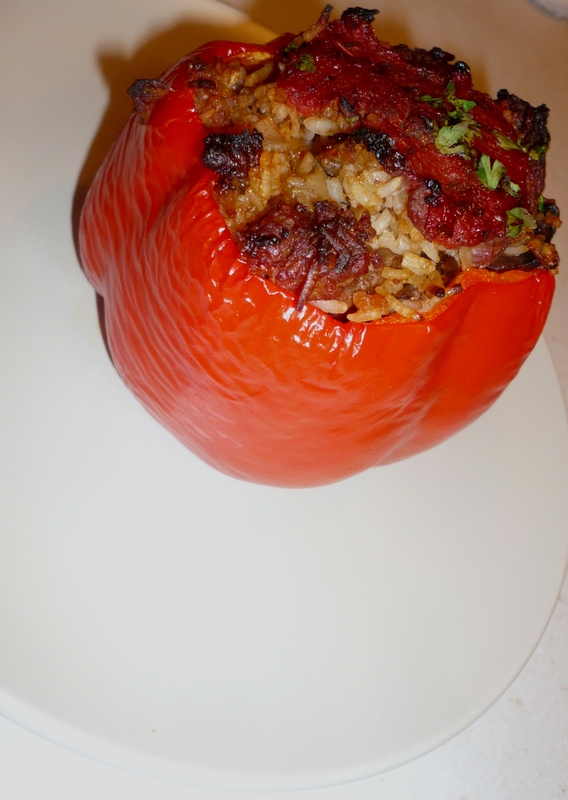 As I’ve stated, I have been dying to try a recipe for stuffed peppers for months. What was I waiting for?!?!? This recipe was absolutely perfect – preparation was simple, creating the filling was fast, and the outcome smelled, looked and tasted phenomenal. It truly was one of those dished that makes the house smell delicious as it’s in the oven. To clarify, I used red peppers and about 1.5 pounds of mild Italian sausage. For the rice, I used the Basmati I had on-hand, and referred to this helpful guide for it to be cooked perfectly. 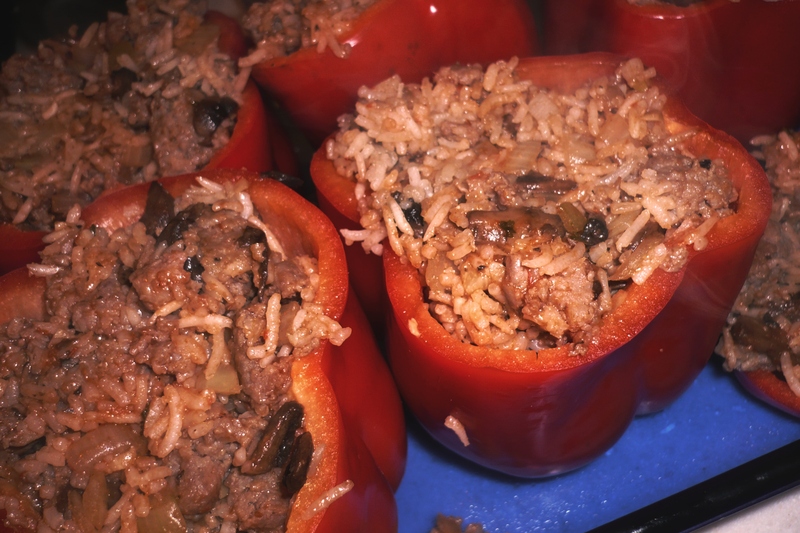 If you notice, the instructions for the stuffed peppers do not state when to add the mushrooms and parsley; once the onion/garlic mixture was just about cooked I added the mushrooms and let them cook for about 3 – 5 minutes before continuing with the recipe. The parsley was added to the tops of the stuffing when the peppers came out of the oven. I can assure you I will be making a second batch of these peppers way sooner than it took me try them in the first place.